As expected, and hinted at by Apple CEO Tim Cook, Apple announced the start of a regular quarterly dividend this morning. They also announced intentions to buy back stock, although the dividend is the bigger news, and drew more questions from analysts on the call. Apple held a conference call at 6am in their home time zone. That’s 9am for us East Coast people, and more importantly, it’s about the latest you can start a call while still getting all the news out before the stock market opens at 9:30am. So for those of you wondering why Apple held the call so early, its’ all about getting news out into the public’s hands before the market opens. Apple has declared a divided of $2.65 per share starting around July. This, alone, will consume almost $10 billion of cash per year, based on Apple’s current shares outstanding of just over 932 million. Apple will also buy back about $10 billion of stock over the next three years. The focus of the buyback is to offset share growth from stock the company issues to employees, and stock that employees buy as part of the employee stock purchase plan. 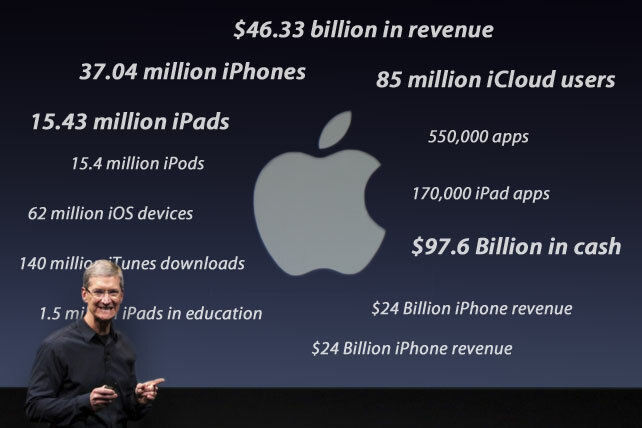 Although Apple has almost $100 billion in cash, only about $34 billion is domestic (held in the US). The rest is in foreign markets, and Apple would have to pay heavy taxes on this cash if they were to repatriate it right now. They are trying to convince congress that these US tax policies on repatriated cash are hurting local investments. It seems like a no-brainer to me. Apple doesn’t need to bring the money back home, and won’t if it is heavily taxed. Unrelated to the use of cash announcement, Tim Cook did reveal that Apple had a “record weekend”, in vaguely answering a question about the launch of the new iPad. In the world of investing, different types of funds have different mandates. Some funds are mandated to only buy dividend-paying stocks. Obviously these funds would not have been allowed to buy Apple stock in the past. Now that this has changed, it opens the door to new buyers. This is one of the reasons that dividends often result in short term spikes in a stock’s trading price. On top of this, we can expect demand among these new investors will be hot. After all, Apple is trading at an attractive P/E (price to earnings ratio) of only 14x based on this year’s expected earnings. Given the super strong growth rate of the company, this puts Apple stock in both the “value” and the “growth” camps at the same time. Dividend investment funds love this. The $2.65 per quarter dividend means that investors are getting about 1.8% per year. Some analysts suggested that Apple could go up to 2.5%. And I agree with them. But we have to remember that companies who initiate dividends always want to position themselves to look good in the future. So they start slowly. They pay what they know can be easily paid. Then, over time, they increase the dividend. Apple could even hold its payout ratio constant, and just grow its dividend based upon organic company growth. But if growth slows, and the need for such a huge cash war chest lessens, Apple can continue to grow its dividend by increasing the payout ratio.